In the past, only the largest companies had the resources and personnel to engage in advanced business analytics. Today, every company needs analytics for its very survival. Advanced systems like WayPoint deliver deep insights into profit drivers, and can give your distribution company what it needs to remain competitive. Distribution company leaders, and their teams, need the next generation of metrics that measure efficiency at every level, monitor costs and profits, and evaluate customer value. These metrics focus sales initiatives and customer service priorities so that profit and cash-flow gains follow. 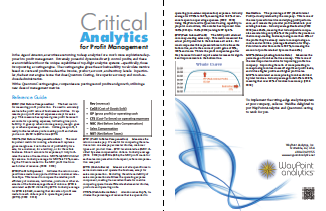 Get our "Critical Analytics for profit Management"
A summary of key metrics to implement in your company. No form to fill.Click below. Cost-to-Serve (CTS) — Measure of all expenditures to serve customers and operate the business, except for sales compensation. Excluding the wide variability of sales compensation stabilizes the operating expense component, making it an excellent basis for metrics comparing operational efficiencies between territories, products and operating units. Gross-Profit to Expenses (G2E) — This is your service budget for the selected patch or product line. Servicing these accounts should produce a positive return. It can only be calculated with a deep costing engine. Profit to Expenses (P2E) — Indicates the return on expenditures made to support activities or customer relationships. This is used to compare the relative profit efficiency of customers, territories, products or other elements of the business, regardless of volume. $P2E is calculated as $NBC divided by $CTS. Profit to Sales Compensation (P2C) — Measures the return on sales pay. It’s useful for comparing the relative return on sales pay across territories, customer types and product lines. $P2C is calculated as $NBC divided by sales compensation dollars. Peak Internal Profit (PIP) — The NBC profit attained on money-making sales only. This metric measured the actual profit potential in the business as it exists. For most companies this represents three to five times the bottom line, and is the source of profit gains of 50%, 100% and more. This is the profit companies go after first, because it doesn’t require sales increases for signifcant improvements to the bottom line. Realization — The percentage of PIP (Peak Internal Profit) actually retained by the company. This is one of the most powerful metrics underlying profit performance, as it reveals the potential profit available in your existing business. Money-Losing Invoice Rate (MLP%) — Measures the percentage of invoices that lose money. This is one of the most important metrics for improving profits in a company. Improving the ratio of money-making to money-losing invoices closes off significant profit leaks, and drives higher profits and higher profit rates. MLP% is calculated as money-losing invoices divided by total invoices. WayPoint has more than 80 main reports with up to 11 drill-in sub-reports for each, for hundreds of expertly-designed pre-programmed reports. So from day one you’ll have the best information to move your company ahead of the competition. With insights nobody else has, you can quickly target the best accounts with the best pricing and the best service. The change to the bottom line is immediate and dramatic. To learn more about WayPoint, click here to see a recorded mini-demonstration, or or call us (480-426-9955) to schedule a live session and Q&A for yourself and your team. The value of Waypoint became very crystal clear on all kinds of information that we didn’t previously have access to, now WayPoint packages it all in pretty concise reports.